It was expected that by December 2010 Chevrolet Volt will be available in the United States though in limited numbers. This is a unique car which is powered by Lithium-Ion battery pack by 1.4 liter four cylinder engines which has a long life and can works flawlessly for many years. There is lot of noise about this vehicle and Chevrolet Volt has laid the foundation for future technology which General Motors terming it be Voltec technology. What is so special about this new technology? There are many things GM can boast of a technology where it has introduced modern electric car. This was back in 1990 that GM started working on the car which was named as EV1, but the project was abandoned. After abandoning the project there was lot of hue and cry and criticism for killing the electric car project. Some people even dubbed it to be a conspiracy due to the pressure of oil companies. Even putting conspiracy aside, the cost of the EV1 was very high and the technology was not advanced that has been given to Chevrolet Volt. The main reason is that Lithium-Ion battery pack is much superior to the nickel-cadmium pack which was used in EV1, this has increased the range and use of lighter material. 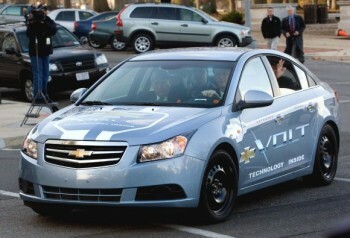 GM has tested Chevrolet Volt both in the hot deserts of Arizona and freezing conditions of Minnesota winter. The Volt has the same set of underpinning which has been used in Cruze but even then the two models are way different than one another. Volt has a unique body and the aerodynamics of the vehicle enhances its fuel economy at all the times. The design allows the Volt to run on battery for first 40 miles before the gas engine steps in. The extended range of electric vehicle should cover around 340 miles on full tank of gas and much more after refueling. The overnight charge will replenish the battery and the car will operate only on electric mode. The big question is that why should people buy Volt as compared to the hybrid options like Toyota Prius or Honda Insight. The reason is fuel economy which is quite superior in Volt, consuming 50% less of gasoline as compared to hybrid vehicles. When Volt runs on electric mode there is almost zero emission, this has not been claimed by the hybrid models. The Chevrolet Volt has a price tag of $41,000 which may limit number of people to buy it, but the good thing is, there is a rebate of $7,500 offered by the federal government. In some states there is an additional $5,000 rebate such as in California. This means that Volt will cost $28,500 with all the amenities. The fuel saving could be around another 500 gallons annually for a person who drives 15,000 miles annually. This means a huge saving of $15,000 in ten years. Volt cost can be recovered say in a time of say 15 years, you are the best judge to decide what is good for you.